MainStage3 is a music application developed by Apple Inc. that is designed for playing live. 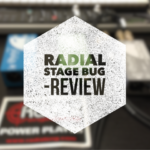 It features similar functions as many DAWs (Recording Programs) however its strength is to be able to apply effects and layer sounds to give palettes of fresh and expressive sounds to draw from while on stage. As the sound of popular praise and worship music has shifted to a more synth driven genre, MainStage is becoming an integral part of church platforms all around the world; replacing the need for churches to by expensive and quickly outdating keyboards. This article will take you through in 5 steps how to implement MainStage for keyboard players. MainStage is only available on Mac computers. If you don’t already have a Mac, this is a big step. But the investment is well worth it. Typically guitarist would spend $1000-$2000 on a quality guitar, the same on a nice tube amplifier and between $200-$500 per pedal, ending up with 5 or more. Now that music has shifted to be synth driven. Piano players should step up to the mark and invest in their gift. The following is the list of a gear to make a simple MainStage keyboard rig work well. ks correctly with any model of keyboard. This is a great compact device that allows you to have extensive control over the sounds in MainStage. Though some Controller Keyboards have knobs and faders built in, anytime you move between keyboards, you are faced with the tedious task of reassigning the knobs faders and buttons. Having the Nanokontrol2 means you can take it with you anywhere and have all your saved settings operate just like your used to. They can be easily fixed to a keyboard with Velcro or tape. , it will protect your laptop’s sound card from being damaged by phantom power (48v) if it happens to be turned on while yor laptop is plugged in. Many users prefer a USB interface to pass the audio but unless you spend lots of money to get a high quality one, you won’t notice much difference. A USB interface becomes a necessity if you require to run the click (metronome) from MainStage. This requires an interface with 4 or more output channels. USB port. This allows the computer to receive to the information of the player pressing the keys. It will then convert this into Audio. Connect the Nanokontrol2. Later in MainStage you can give the knobs, faders and button specific assignments to your needs. to plugin into a DI box. Your sound person should be able to assist getting the sound out to the sound desk from there. If using a USB interface, you will need to select the Audio output before the Mac will send the audio to it. This can be done in the Macs settings under audio. Or a shortcut is to hold Option/Alt and click on the Volume icon in the top right of the screen. MainStage3 can be downloaded directly from the App Store. The first time you open MainStage, it will ask you to download additional content. I recommend just ticking all the boxes and download the lot. So make sure you have lots of internet data and hard drive space available (around 50GB). There are 3 sections in MainStage: Layout, Edit and Performance. Layout Mode: This is where you setup the hardware to talk to the computer. Typically I lay out the controls on the screen in a visual representation of what I have in physically in front of me. Click here to view the template that I have already for the Nanokontrol2. Edit Mode: This is where most of the time is spent. Here you can start building “patches” which is a preset you can create and give titles. The real power of MainStage is being able to layer sounds, move them around the keyboard and apply all types of effects. An amazing feature of MainStage is MIDI effect called “Chord Trigger” which allows you to program chords played by 1 finger. This frees up your hand to play a lead line or modulate effects and filters. A new expressive and dynamic way of playing the keyboard! There is an expansive library of sounds for you to explore and started using in worship sets. There are few pianos to choose from as well many styles of synths and arpeggiated sounds that you can layer and customise as you please. Performance Mode: This last section can be used while playing live. It basically blows up the screen so you can see more clearly and removes all the tech features for a cleaner look. 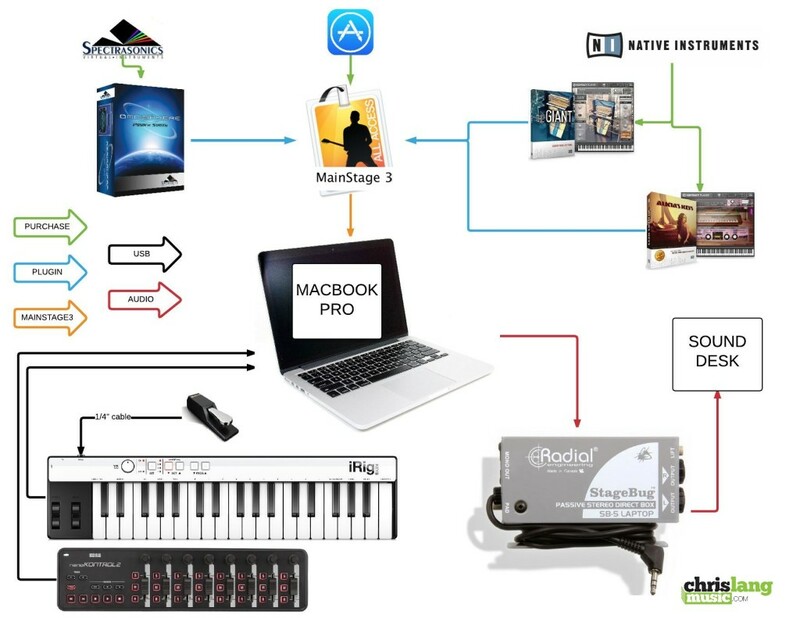 The Keyboard with Chris Lang DVD features lessons on how to setup and start using MainStage. MainStage comes with a huge library of sounds that are downloaded during the install page. However, the use of third party plugins can greatly enhance the depth and expression that you produce. The most piano players would agree that there isn’t enough depth in the MainStage piano samples for them to be satisfied to let go of their digital piano. Native Instruments has an assortment of very expressive Piano’s available from they’re website (which will often be on a 50% off sale a couple times a year). My favourite of these for an around worship piano is Alicia’s Keys. The Giant and The Gentlemen are also worth a mention if your looking to expand your piano library even further. The next plugin I highly recommend is Omnisphere by Spectrasonics. This is a synthesiser plugin that comes with over 50GBs of sounds. They are presented in the most atmospheric and expressive way possible. Hunting through the 8000+ library of preset sounds is so inspiring that just listening to the samples evoke worship. The sounds are also highly customisable so you can achieve just about any sound you can imagine or even had never imagined. They have recently updated Omnisphere to Omnisphere 2 which has even more sounds and sophisticated way searching through and manipulating the sounds. popular plugin being used to create edgy synth sounds in praise and worship. There are many benefits to using MainStage as part of the worship team. Not having to use tracks can free the worship team to play together and move into spontaneous worship progressions. Because of the ability to spread out and layer sounds around the keyboard, a single keyboard player can do so much more with the 2 hands and 10 fingers God has given us than we could with a standard digital piano. Because it is software based, it is continually updatable and customisable. Using MainStage is a fresh style of keyboard playing that young people understand and grasp very easily because the playing is based around the current sounds being produced. So it’s a great way of getting more people involved and expanding your team. If your a keyboard player (or any other part of the worship team) and have been listening to how popular worship music has evolved over the past few years and wanting to expand the gifts God has given you, implementing MainStage could be just what your church needs you to do! hello Chris Lang. I would like to ask if i buy your patches is it will be the same even thoug i dont have omnisphere? Thanks! Hey Chris I am new to this. My question to you is if I have the softwares and I purchase the sounds that you have I don’t have to make them or try searching for them? If you have the same software that I’m using and you download a patch, it’s just a simple drag and drop and your up and running like the videos on youtube. Hi Chris, could it be possible if i use the m-audio instead of irig and windows instead of mac ? Hi Kenneth, you can use m-audio or many other keyboards. But MainStage is available on mac only. Hi Chris. Follow up to Kenneth’s question. i am also using m-audio 61 keys. will it still gonna work? Yes, Any USB/MIDI keyboard will be fine. Hi Chris, thank you for the in-depth breakdown. I’ve been on a quest to update our keyboard with virtually no budget for about 5 months. Saved up for a used MacBook (all because of Mainstage) and Omnisphere 2, and just ordered the nanoKONTROL2. After reading your post there is hope in sight!!! So excited! Hey Chris I have a question in your Keys DVD do you show how to layer different sounds? And set up for Sunday mornings? i have a question if im using the KORG Bundle Software and buy your Patch is it okay? Yes it is great fun playing the lead lines on the side! I think you should go for it. There are other alternatives on pc like ableton… but i dont know too much about it and have seen that it is much more difficult to use than MainStage. I only started this whole thing once i transitioned to mac and haven’t looked back. Mainstage is only $30 from the app store and has stacked of sounds built in… then adding omnisphere adds a lot to your palette… so going the mac route is my suggestion. can i just use Omnisphere as an instrument in Abelton? Yes many people do. I do not have ableton so may not be able to answer many more questions regarding it. hi chris have a m-audio oxygen 25 I can use it without the nanoKontrol? yes, you will just have to reassign everything in layout mode before you begin. existe algun tutorial donde puedas explicarme como asignarlos? Hi, this is covered in the keyboard dvd. Hi, I’ve been using Mainstage 3 and now I’m ready to try a plug in. I downloaded a trial of True Pianos, which seems to sound nice in the videos. But how do I add it as an instrument channel strip? I’ve read that the option “AU” is supposed to pop up when you create an instrument strip, but that doesn’t happen when I try it. once installed properly, to access au instruments… create a new channel strip, click on the blank “instrument” tab and in the drop down menu you should see AU instruments down the bottom. We are 4 Bands in our church and each Band has one Synths Player. Now we want to share our patches and using Dropbox for it. But if I download a patch from my friend it does not sound the same like the original. What can I do? There are many factors that are involved… to be identical, make sure your running the same versions of software and plugins. Also make sure you have a uniform concert template that you all use so that the patches load with the same settings and controls. My nanokontorol2 concert template can be easily configured to work with almost any device. We are kind of new at this.. We have the nanokontrol 2, mainstage and omnisphere, all brand new purchases, so nothing is programmed yet. We really love your sounds, so we are looking to buy some of your patches. Do we need to purchase the nanokontrol concert template for your patches to work? Also, since nothing is programmed on mainstage yet, will the nanokontrol concert template you offer program all the different sounds to the knobs, sliders etc automatically without having to go through the layout?.. sorry for the long question, we are new at this.. thanks again! You are great!! Hi Kim, it is recommended that you use my template… that way the patches should just drop in like you see on the video. can i use the nord stage 2 ex 88 instead of a Usb controller keyboard to play with your patches ? Yes i have had people use midi out of nords to control MainStage and use my patches. Hey Chris! Love what you do! Quick question, how would can I see the nanokontrol 2 on mainstage, because my midi device works and it plays sounds with mainstage, but my nanokontrol is showing that it is plugged in, however, there is no picture of the device on mainstage and no movement if I move the faders around. Any help would be great! Thanks! Are you using my nanokontrol2 template? My patches should just load up with the assignments. But if you are using your own patch, you have to assign things to the faders for them to move. Feel free to use the contact form to get in contact with me. Hey Chris! This article has been so helpful to me in my exploration of Mainstage. I recently purchased Alicia’s keys and The Giant during NI sale and download both of them to my mac with the native access app. However I can’t figure out how to get them into Mainstage though! I’ve searched youtube for help and didn’t find anything. Thanks! Once that software activates the plugins on your laptop, add a new instrument on the channel strip and kontakt player will appear under AU instruments. Once inside kontakt player, click on either the giant or alicias keys picture on the left then drag the text underneath the image into the blank space of the player… then you should be going. Hi. I set up my patches to trigger those time based sounds when you play them… so the lock in fairly well if your playing along to a click. Chord based push/ducking sounds usually lock in fairly well as long as you keeping the correct rhythm aloneg to the click. Ideally you would sync in MainStage with the other click if possible… or use an interface with more than 2 outputs so you can run click out of the 3 output. Can you use a tap tempo for the appegioator? Hi Leigh, Yes. In fact, the nanokontrol concert template has the play button is programmed to tap tempo. When I use some of your patches my CPU is maxing out, is there something I can do to help fix this? Hi Zac, you can go through and try removing some of the “unessential” omnisphere layers by going into the multi mode and deleting their layer. Hello, I use Omnisphere 2 inside of Mainstage. Should I buy the Mainstage 3 + Omnisphere 2 version or the Omnisphere Multi version? Hi Even, thanks for checking! Just the Mainstage + Omnisphere Patch is what you need. The Omni Multi files are for users of other programs like ableton. hola Chris.. yo solo tengo Mainstage 3 No el Omnisphere.. me sirve igual? si intalo omnisphere.. cual deberia comprar?? Hi, I from Ukraine? How can I buy your patch? Does paypal not work in Ukraine? Hello Chris, I have a cuestion. Hi David, If you are using mainstage with omnisphere get the mainstage+omni patch. If you are using omnisphere with other DAWs then get the omnisphere multi files. Omnisphere multi files contain various layers of sounds for omnisphere… if you buy the mainstage patch these settings load up accordingly as part of the patch but will only work in mainstage. Hi Chris! Can i still do this with AKAI Mini MPK-II? Thanks! If you get the nanokontrol template you can easily map the knobs and faders on the screen to your device. Hey Chris – getting ready to make the shift to Mac/Mainstage/Omnisphere. We’ve got an old MacBook that meets the minimum requirements for Mainstage and Omni, but just barely. If I download Mainstage to this old Mac and it doesn’t work well, do you know if I will have to buy it again in order to put it on a new Mac? Mainstage is linked to your Apple ID so no problems there. Last time i moved omnisphere over to a new computer, I got hit with $30 registration fee. Used Mainstage this week for the first time, it mostly went well. 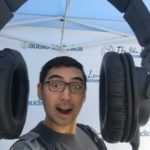 🙂 Question – Our drummer runs our click track from an IPad to our in-ears. Is there a way to sync Mainstage arpeggiatiors and other tempo-based effects on my patches to that sort of click? I see vids/articles online about syncing to an “external MIDI clock”, but I’m not sure that it’s the same as what we are running? Hi, I set up my patches in a way that you have to play on time to get the pulses and arpeggiators to sit right. You can send midi clock to an external click track from mainstage but the drummer would have to use a metronome device that accepts midi. (I have seen this working but never set it up). Another way is to send a click from mainstage. You will need an audio interface with more than 2 outputs to able to run Left, Right, Click. I have done this before on tour where some songs metronome was sent from mainstage and other times the drummer used the ipad. Just meant we needed 2 channels of click on the sound desk (or you could combine them down a matrix or something).